We analyzed changes in employment figures between 2013 and 2018 from the 381 metropolitan areas defined by the U.S. Census Bureau. We started by mapping a vertical spike indicating the relative percentage of job growth change in the best city from each state. Then we outlined the geographic region of each metro area, color-coding each one according to a sliding scale of median household income from under $50k to over $65k. The result is an intuitive map showing the best places for job seekers combined with how much money a household might expect to make. These are the top ten job markets in terms of employment change from 2013 to 2018, together with the median household income for each metro area. We can learn a lot about the American economy and the job market by looking at our map. The broader context is that unemployment is at its lowest rate since 1969 even if wage growth hasn’t necessarily spiked. That means the places on our map are truly remarkable job markets at the center of the recovery, perhaps because they were hardest hit by the recession. Consider Elkhart, IN for example, an area that’s seen tremendous job growth of 24.0% but where wage growth is still less than $60k. The town is known for being the “RV Capital of the World” because it has several major RV manufacturers and suppliers. That means blue collar work with low wages. Workers just can’t compete for significantly higher earnings because manufactures can just move jobs overseas, something President Trump is looking to improve. There are other places seeing substantial gains in employment thanks to a thriving and well diversified economy. Consider Austin, Charlottesville and Nashville. These cities have a reputation as fun destinations with music and tech scenes. They are mid-sized cities with universities, hospitals, and large well-known employers. These are the ingredients for long-term economic growth and positive employment numbers, as our map clearly indicates. Another story hiding in this map of thriving job markets is the number of places seeing substand growth. Two places actually saw negative job growth from 2013 – 2018, Cheyenne, WY and Anchorage, AK. The people in Burlington, VT meanwhile only saw 0.8% growth, and even in New York City the change was just +5.3%. 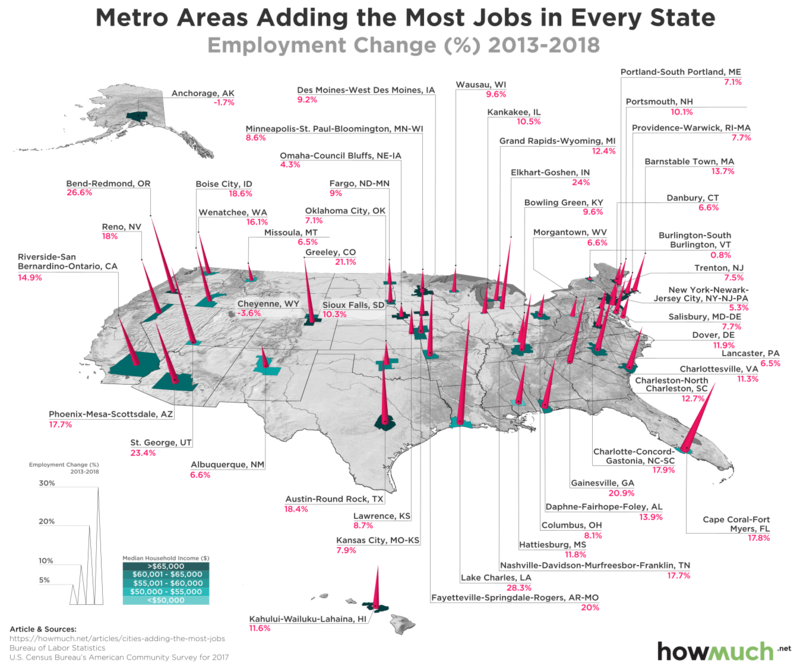 These are the best metro areas for job growth during a time when the unemployment rate fell across the nationfrom 7.2% down to 3.7%, a rate that many observers believe indicates full employment. The results are disappointing to say the least. There is therefore significant diversity across the cities on our map. Some places are factory towns with unsustainable growth rates. Others are truly remarkable places to live with thriving, growth-oriented economies, and still others are barely seeing any benefits from the economic recovery.